Leather-look A4 textured binding covers are perfect for everyday reports & documents. Heavy-weight 300gsm A4 size board helps create a stylish presentation. Leather embossed finish; great value for everyday reports and documents. 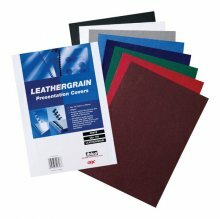 Choose from a wide range of traditional colours to mix and match with plastic and wire binding.